Cut the new potatoes in half if they are large and place in a pan. Cover with salted water and bring to the simmer. Cook for 8 – 15 minutes or until just tender when pierced with the tip of a knife. The cooking time can vary depending on their variety and freshness. Drain the potatoes and return to the pan. Add the butter, olive oil, 2 heads of elderflower and a squeeze of lemon. Season well with salt and pepper, turn together well and set aside to rest for a few minutes. 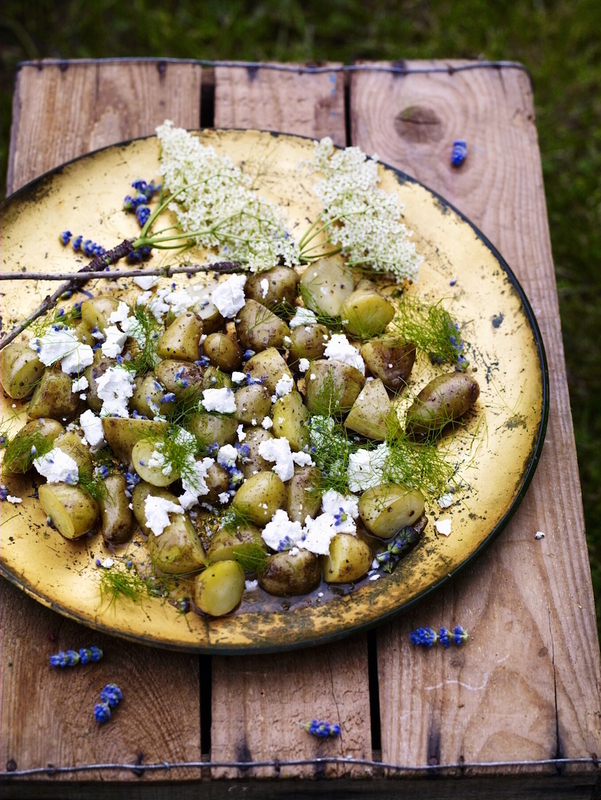 To serve, scatter the potatoes out over a large platter along with all their lovely butter. You can discard the elder heads. Crumble over the goat’s cheese and lavender petals then tear over the fennel tops if you have them.